Arts Visalia is pleased to present Paintings of California & Beyond, an exhibition featuring the work of Kenneth Conn. Conn’s work truly captures the vast expanse and character of California’s Central Valley within the medium of oil on canvas. 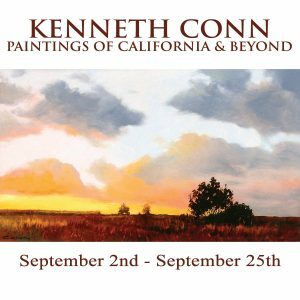 Kenneth Conn: Paintings of California & Beyond will be on display at Arts Visalia from September 2nd through September 25th, 2015 with an opening reception to be held Friday evening, September 4th, from 6 to 8pm. Admission is free and open to the public. In addition, Mr. Conn will be the featured speaker for a luncheon “meet-the-artist” event held at the Southern Pacific Depot restaurant on Saturday, September 19th at 11:30 am. Reservations for the luncheon may be made by contacting the Depot at 559-732-8611 or online at http://www.depotvisalia.com/reservations.html. Kenneth Conn has painted since he was a teen. His ambition after high school was to attend an art institute and study for a career in commercial art. His plans changed when the Korean War erupted and he found himself with a one-A draft classification. He joined the Navy and was selected for officer training. Ultimately, he served as a naval aviator. he later attended law school, practiced law and became a superior court judge. All the while, he continued to draw and paint. After retiring, Conn became free to exhibit and offer his artwork. Although he describes himself as a “self-taught” artist, he has devoted many hours to study and has attended several workshops. He paints in oils and is inspired by the landscape of Central California. He describes his style as “contemporary realism” and admits being influenced by Edward Hopper and California impressionists such as William Wendt and Granville Redmond. He maintains his studio and makes his home with his wife, Carmelita, in Visalia, California.